Dallas - Win Tickets to The Marvel Experience! Dallas – Win Tickets to The Marvel Experience! Dallas/Fort Worth comic connoisseurs and superhero fans rejoice! The Cotton Bowl Stadium at Fair Park will be transformed by the Marvel Universe from January 15th through February 1st, 2015 for the debut of The Marvel Experience: The World’s First Hyper-Reality Tour. The touring Marvel adventure is currently previewing in Phoenix, but will have its World Premiere in Dallas, with a red carpet event scheduled to celebrate the opening. As agents of S.H.I.E.L.D. in training, guests of The Marvel Experience will swing with Spider-Man, smash with Hulk, fly with Iron Man and more, all in preparation for an epic battle alongside Marvel’s biggest Super Heroes in a fight against Red Skull, M.O.D.O.K. and an army of evil Adaptoids. 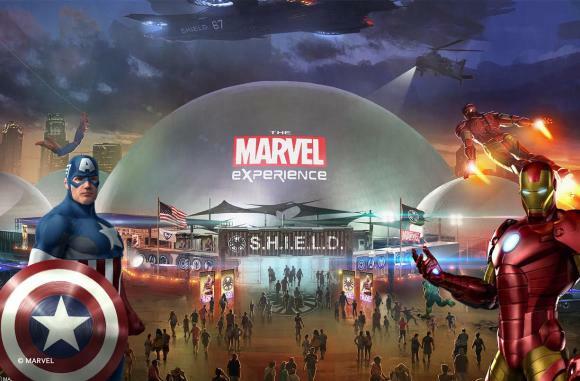 The Marvel Experience will incorporate next-generation interactive technology including augmented reality, multi-person gaming and RFID progress tracking so you can see yourself in action. The bleeding-edge technology and advanced computer animation will allow the audience to join the adventure and become heroes themselves. Though the description will definitely appeal to kids, Hero Ventures CEO Rick Licht promises that the event was created with the “extensive Marvel fan base over the age of 25” in mind. Hurray! Grown ups can be geeky, too!! Tickets for The Marvel Experience, starting at $27.50 per person, are now available for purchase. Disclosure: I received complimentary tickets from The Marvel Experience, however all opinions are my own. My friend would love this!! And I agree with Valery. I’m going to go with Iron Man. They nailed it by picking Robert Downey Jr. to play him! Captain America bc it reminds me if my hubby!! That’s why I want to win so bad… I would take him to this expo!! LOVE this!! My son and hubby would be so excited if I won!! Totally surprising my bonus son with tickets to this for his Birthday!! He will LOVE it! It would be awesome if I won for him! My favorite is Black Widow…his is, well his is all of them! He LOVES Marvel!